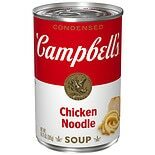 Shop Campbell's Condensed Chicken Noodle Soup (10.75 oz. )10.75 oz. 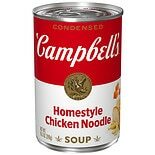 Shop Campbell's Condensed Soup Homestyle Chicken Noodle (10.5 oz. )10.5 oz. Shop Campbell's Condensed 25% Less Sodium Chicken Noodle Soup (10.75 oz. )10.75 oz.